An artist's illustration of a SpaceX Falcon 9 Heavy rocket launching into space. A massive new private rocket envisioned by the commercial spaceflight company SpaceX could do more than just ferry big satellites and spacecraft into orbit. It could even help return astronauts to the moon, the rocket's builder says. "It certainly opens up a wide range of possibilities, such as returning to the moon and conceivably going to Mars," Musk said. Traveling that far requires more lift than most rockets flying today, including NASA's space shuttle. But the Falcon Heavy, which is designed to generate 3.8 million pounds (1,700 metric tons) of thrust, would be able to do the job, Musk said. The Falcon Heavy booster is designed to have more lifting capability than any other rocket in service today, and about half the capability of the most powerful rocket ever built, NASA's towering Saturn 5 booster, which sent the Apollo astronauts to the moon in the late 1960s and early 1970s. The Falcon Heavy may not be able to carry everything needed for a mission to the moon in a single go, but it could potentially launch various components separately. For example, the astronauts and moon lander could be launched in one trip, with another liftoff following to deliver the vehicle that would ferry the crew back home, Musk said. "As far as human standards are concerned, they are designed to meet all of the published human standards," Musk said. The Hawthorne, Calif.-based company hopes the Falcon rockets will be used to ferry astronauts to the International Space Station, and possibly beyond, after the space agency's space shuttles retire this year. SpaceX already has a $1.6 million contract to haul cargo to the space station aboard the Falcon 9. In addition to NASA missions, the Falcon Heavy could prove useful for other commercial space ventures. For example, the Las Vegas-based Bigelow Aerospace is designing a commercial space station, and eyeing establishing a private moon base. Such a destination would require a vehicle to help build it, as well as a rocket to ferry space tourists and other clients to and from the base. Even farther destinations like Mars are not out of the question with the Falcon Heavy, Musk said, though such a trip would probably require multiple launches. He brought up the possibility of a mission to collect samples of Martian dirt and return them to Earth for studying – an endeavor that has so far proven prohibitively complicated. "The Falcon Heavy has so much more capability than any other vehicle, I think we can start to realistically contemplate missions like a Mars sample return," Musk said. And the company isn't content to stop at the Falcon Heavy. 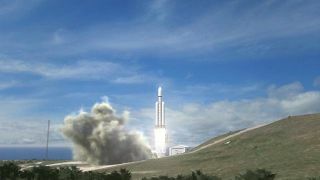 SpaceX is also considering building an even more powerful rocket called a "super heavy-lift" vehicle that would have about three times the capability of a Falcon Heavy, or about 50 percent more power than the Saturn 5. Musk said SpaceX has a small contract with NASA right now to explore the possibility of building the super heavy-lift rocket.